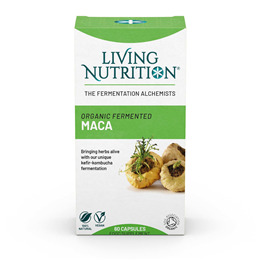 Living Nutrition`s Maca Alive follows a traditional shamanic recipe that uses three types of fermented raw maca plus camu camu berry for added vitamin C.
Maca is a highly prized food in Peruvian culture. It was considered sacred in it’s fermented form, and was once used in ceremony to bring great health and power to all that consumed it. For the modern lifestyle, it can help bring balance to the body, and support energy levels and virility. *(Fermented, freeze dried) Maca (Lepidium meyenii) root, *(raw gelatinized) Maca (Lepidium meyenii), *Camu Camu (Myrciaria dubia), Vegetable cellulose capsule (hydroxypropyl methyl cellulose). 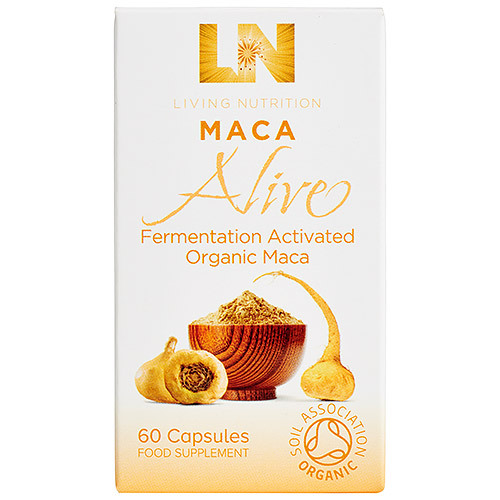 Below are reviews of Living Nutrition Maca Alive - 60 Capsules by bodykind customers. If you have tried this product we'd love to hear what you think so please leave a review.